…an excellent group of players jamming, meshing together fluidly, and the energy is consistently high. A fiery and dedicated improvisor and composer, saxophonist Idit Shner’s latest quartet recording highlights her rich and ongoing relationship with pianist Josh Hanlon and drummer Stockton Helbing, which dates back to the early 2000’s when Idit was working on her Doctorate at the University of North Texas. Along with bassist James Driscoll, the quartet tackles a program of Idit’s compositions, all based in the jazz tradition but with influences ranging from traditional melodies & rhythms from Zimbabwe, to classical Arabic music, to the Latin-tinged grooves of McCoy Tyner from his early ’70s recordings. For the album’s lone standard, Billy Strayhorn’s “Passion Flower,” Shner declares her debt to one of jazz’s definitive alto stylists with this haunting Ellington band staple, one of Duke’s many feature numbers for Johnny Hodges. This cd can be purchased on the Origin Arts webiste. 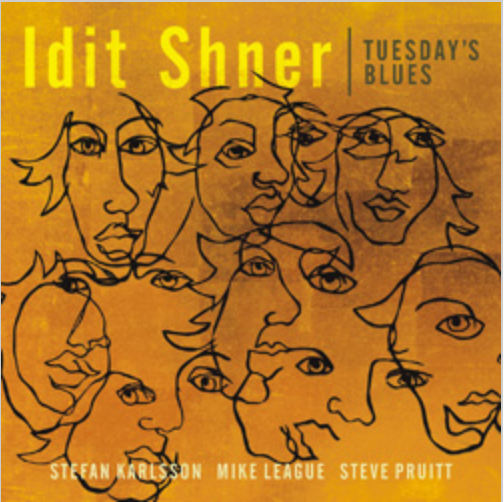 Saxophonist Idit Shner is the embodiment of a modern jazz musician: both forward looking and steeped in tradition; simultaneously international, local and personal. Her new recording Tuesday’s Blues displays all those qualities and more. 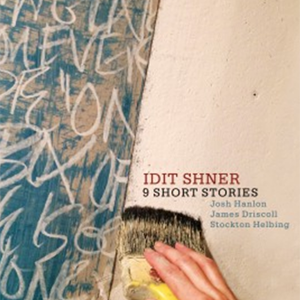 Five of the compositions here derive from music (ancient, modern, sacred, secular) that Shner heard growing up in Israel. All have personal meaning for her, and all have been melodically, rhythmically and harmonically transformed by her, in the best tradition of jazz. Featuring pianist Stefan Karlsson, bassist Mike League, and drummer Steve Pruitt. 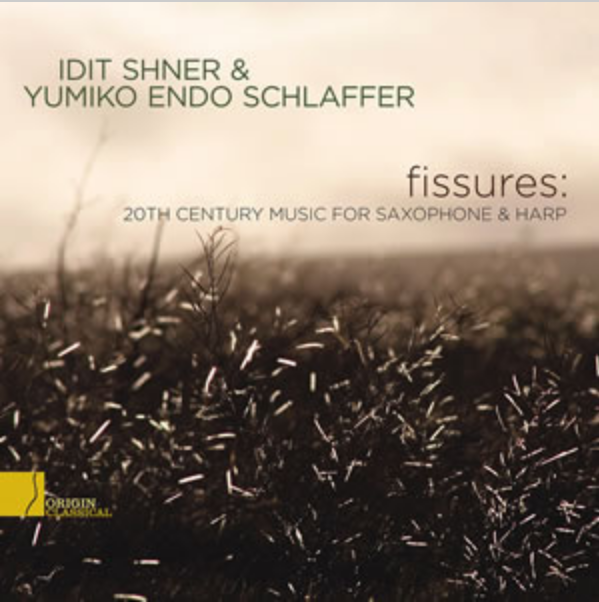 “Fissures” presents saxophonist Idit Shner and harpist Yumiko Endo Schlaffer in a program of works for this unique combination of instruments that has rarely been represented in recorded form. A wide array of composers and musical expression are represented in the selections – from Rokus de Groot’s bass saxophone feature “Cadenza,” to Yvonne Desportes’ virtuosic “Une fleur sur l’étang,” and Dr. Yusef Lateef’s light and transparent “Romance.” Now based in Eugene, Oregon, Idit Shner is an active performer of both jazz and classical music and has commissioned and recorded new music, performed solo recitals in the US and Israel, and plays regularly with the Oregon Symphony. Ms. Shner appeared in Israel as a featured soloist in 2006 with a symphony orchestra and her most recent solo recital in Israel was broadcast live throughout the country. Currently Ms. Shner serves as Assistant Professor of Saxophone at the University of Oregon. Yumiko Endo Schlaffer has performed at the Imperial Palace for the Empress and Her Royal Family of Japan. She has been featured as a solo artist with several symphonies, including Tokyo Metropolitan Symphony Orchestra, Chicago Chamber Musicans, Las Colinas Symphony Orchestra, and The Tokyo Philharmonic Orchestra. She has won first prize in two different divisions of the Japan International Harp Competition. 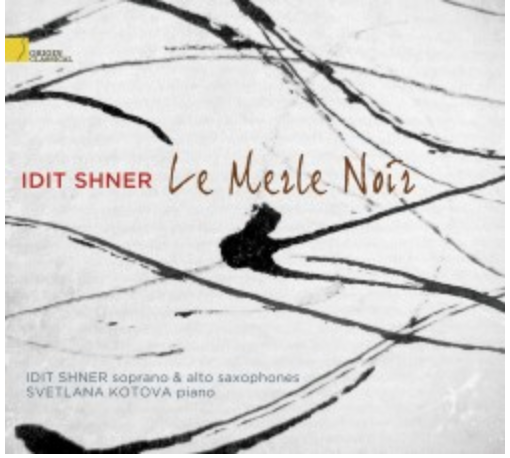 For her newest recording, saxophonist Idit Shner presents a “mid-century modern” recital of original and arranged works for saxophone and piano. All of the compositions date from 1939-1977 including original works by Eugene Bozza, Paul-Baudouin Michel, and Philip Glass, along with arrangements of pieces by Olivier Messiaen (Le Merle Noir, for flute and piano), Ross Lee Finney (Sonata in A minor, for violin and piano), and Odon Partos (Yizkor, for cello and orchestra). Accompanying Shner is the incomparable pianist Svetlana Kotova.